Lancelot Odua Imasuen is one of the most accomplished directors in Nigeria’s socio-cultural movie industry, popularly called Nollywood. He was the focus of Nollywood Babylon, the documentary film directed by Ben Addelman and Samir Mallal and was one of the main attractions at the Sundance Festival in 2009 and he also got interviewed on CNN Screening Room. Therefore, public expectations are always high whenever Lancelot Imasuen premieres a new movie. 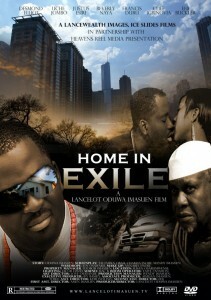 If one can judge a movie by the trailer, then Lancelot Imasuen’s Home In Exile should attract thousands of people to the cinema. The shots look good and show that the director knows what he is doing and has a very good director of photography. But as it is common in most Nollywood movies, the actors are yet to perfect their skills, because they do not know that there is a difference between acting for the theatre and acting for film. Film is not stage drama. And in most cases, they are camera conscious. The cast of leading Nollywood stars like Desmond Elliot, Justus Esiri, Francis Duru and Uche Jombo should pull crowds to the cinema. The world premiere of Home in Exile was at the popular Odeon Cinema in London and reports said it was well received and it was screened at the Carlow African Film Festival on Friday 17th October 2009. The full review will be published after we have seen the movie at the cinema. A young prince and heir to the throne of his father graduates from a medical school in the US, and convinces his fiancé and best friend to come with him home to help him set up a befitting medical centre to carter for the health needs of his beloved home land not minding the offer of good life by the American government, but some thing goes wrong. His fiancé excitedly sits on the King’s throne against the tradition of his people and consequently must become the wife of the King — as tradition demands. SHOWING AT CINEMAS IN LAGOS FROM FRIDAY MARCH 19, 2010.